Kadam Dam is also called as Kaddam Narayan Reddy Project it is about a distance of 3km from Peddur Bus Stand, about 50km of distance from Nirmal, nearly 108km from Adilabad and 260km from Hyderabad, the dam is located at kaddam peddut in adilabad district. It is a major reservoir constructed over kadam river a tributary river of Godavari. It took 15years to complete the construction of this project started and completed between 1949 – 1964. The purpose of this Project is to irrigate 68000 hectares of agricultural land present, prior to this it was 25000 hectares. 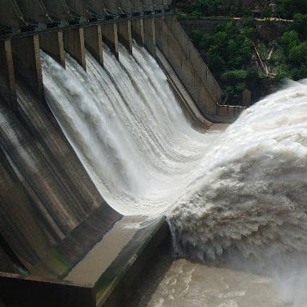 This dam intigrated with sriram sagar project. It has two major canals for water distribution, left canal length is at an average of 76.8km and right canal length is about 8km. The reservoir having boating facility, visitors enjoys the boating and the reservoir has beautiful surroundings. There is a park adjacent to the dam tourists can have good experience there. Tourists can have awesome experience in peak monsoons as the gates of the project opens and the gushing of water from the gates flows down to the bottom with sounds and also as the droplets of water falls on the visitors makes them feel as if it is drizzling.